MSC Apex 101 for Aerospace Applications - Assembly Management and Modeling | Evotech Computer-Aided Engineering Ltd. Effective use of FEA simulations plays a big role in the design and development of aerospace vehicles, enabling engineers to deliver higher-quality products that can handle various loading scenarios. Due to the complexity of the aerospace structures, the FEA model consists of many parts and assemblies. These assemblies are usually hard to manage and require special modeling techniques. This webinar will discuss a number of MSC Apex-specific approaches to handling large assembly FEA models. All these techniques are focused on ‘real world’ geometry, in this case a fuselage frame structure made up of over 850 sub-assemblies. 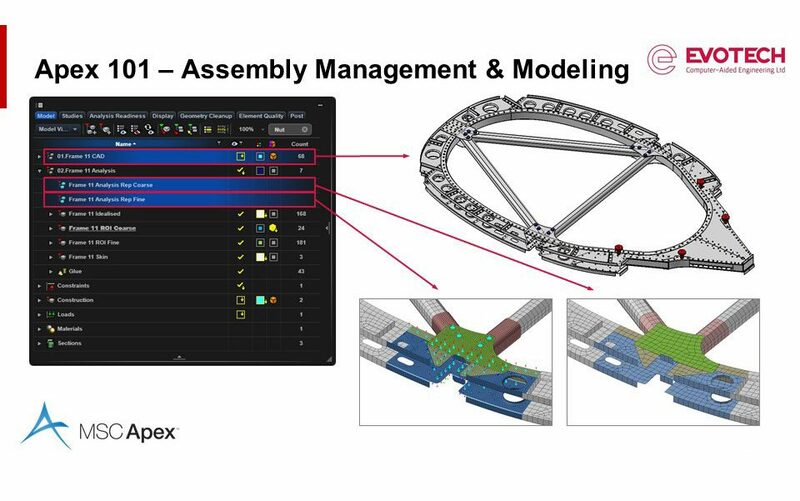 Model Assembly Definition – Demonstrate how complex CAD and Model assemblies are imported, created, manipulated and viewed in MSC Apex. Sub-Model Verification – Look at how a discrete part is defined within the assembly structure for model checking and verification. Full Assembly Verification and Analysis – Sub-assembly integration and solve performed at many levels within the product hierarchy. Model representation – Discrete model representation, such as a coarse ‘loads and/or fine ‘detailed joint’ definitions, allows models with different fidelity to be contained within a single Apex database.